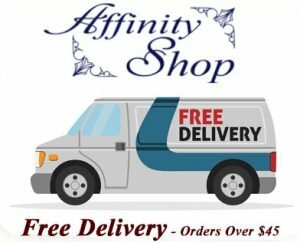 Terms and Conditions – Affinity Shop Website Sales. Terms and Conditions operate in compliance with the applicable State and Territory Laws governing Australia. We are committed to protecting your privacy. Client records are regarded as confidential and therefore will not be divulged to any third party, unless we are legally required or to do so, or if we believe it to be in the best interest of our customer. Customers/clients are requested to retain copies of any literature issued in relation to the provision of services. Where appropriate, we shall issue customers/clients with appropriate written information, handouts or copies of records as part of an agreed contract; for the benefit and protection of both parties. We will not sell, share, or rent your personal information to any third party or use your e-mail address for unsolicited mail. Any emails sent by Affinity Shop will only be in connection with the provision of agreed services and products. Our Terms are payment in full before any products will be sent out, picked up or delivered. All goods remain the property of Affinity Shop until paid for in full. Our prices are listed in AUD, we require AUD currency for payments. If any money remains outstanding by the due date it could incur late payment fees and interest until such time as the balance is paid in full and final settlement. We reserve the right to seek recovery of any monies remaining unpaid sixty days from the date of invoice via collection Agencies and/or through the Small Claims Court In such circumstances, you shall be liable for any and all additional administrative and/or court costs. If you are wishing to cancel or change any order placed with us you should do so as soon as possible. We reserve the right to charge a fee if required(we have never issued a charge or restocking fee to date). This charge would cover administrative, restocking or out of pocket expenses incurred. We maintain the right to cancel any order, or to reject orders that we think are not financially viable or in our best interests. Our products come with a 1 year manufacture fault guarantee, unless the manufacturer of the product specifies otherwise. Sometimes these terms and conditions can vary between different products or manufacturers. We provide our products in good faith and under the condition that they will be used with a reasonable level of care and not misused. In the event of manufacturing defect or faults we will either supply a replacement product or could opt to have products repaired if appropriate. You the customer, may need to provide proof of fault or supply information to us in order for us to assess your claim. Faulty products may need to be sent back to us or the product manufacturer for your claim to be met. Generally we do not provide refunds on shipping charges. For change of mind returns, we reserve the right to charge a 10% restocking fee as well as retain the cost of processing, handling and delivering the original order. Mostly our stock will be ready for shipping and we have products available. We do not warrant that the service from this site will be uninterrupted, timely or error free. By using this service you thereby indemnify Affinity Shop and associate parties against any losses or damages in relation to products purchased. It is well understood that suppliers or shipping can be held up in the supply chain. We do our best to avoid these issues and keep our customer/clients informed of any issues or delays. The information on this web site is provided on an “as is” and in good faith basis. You should get your own advice on any issues if you need further information. we excludes all representations and warranties relating to this website and its contents or any other third party, including in relation to any inaccuracies or omissions in this website and/or the literature provided. we exclude all liability for damages arising out of, or in connection with your use of this website and any products purchased through Affinity Shop. The above exclusions and limitations only apply to the extent permitted by relevant Australian law. None of your statutory rights as a consumer will be affected. Your privacy will be maintained and is of great importance to us. Sometimes we may use or collect information in relation to our website and usage of our online products or service. We may need to collect this sort of information to improve our website or it’s operations. We expect that information we share with customers is not forwarded or shared with third parties without our written consent. If you would like to link to or from this website, it would be expected and appropriate to ask permission and to inform us of any intention to do so. No content contained within this website can be used without permission from Affinity Shop or the relevant owners of the information. Copyright and other relevant intellectual property rights exists on all text relating to the services we provide and the contents of this website. You cannot reproduce or use any associated content from Affinity Shop or it’s website unless given permission to do so. Terms and Conditions – We reserve the right to change or modify our terms and conditions if required. We reserve the right to refuse sales or product supply if not in our best interests. If you wish to discuss our terms or conditions, please get in touch with us. Please Sign Up with us to receive latest news, discount coupons or product specials.